Every year I make this wreath with holly (Blue Stallion with deep green leaves and no berries since it is a male) from the garden. It is wired to a circle with an X in the middle that I cut from cardboard. I was inspired by a Revels performance. All the details are no longer clear to me (it was probably twenty years ago) but I remember it was a bit of a departure. While the Revels usually focuses on a cultural theme, that year there was an ongoing story line about St George that was written by Susan Cooper. There was a large wreath as part of the set with an X in the middle. The symbol of a circle with a cross is also in Susan Cooper's The Dark is Rising, book two in her five part series and a favorite holiday read. I believe that year the Revels also featured a sound and light installation by Christopher Janney. 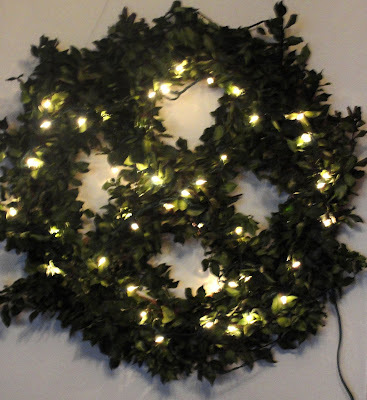 Beautiful wreath, Susan. I believe that this symbol is a very old one, and can only speak to us through its image, but it has been interpreted to be a symbol of Earth, or the four directions (and thus the classical four elements, earth, air, fire water), and also forms the basis for the Wheel of the Year. Thanks Cari. I started to write about the wheel of the year on this post but decided to keep it short. One of the things I hope this set of posts over 12 days will help me do is simplify so that I can post more regularly. We shall see.